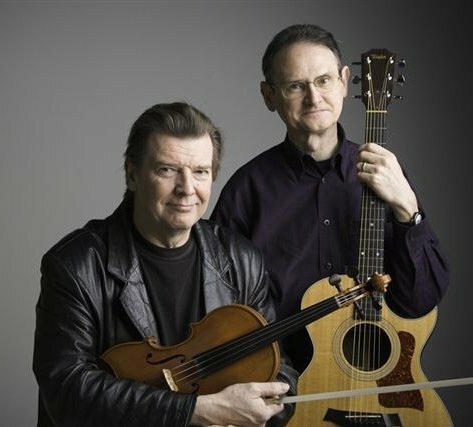 The New York Times puts Kevin Burke & Cal Scott's CD "Across the Black River" on its list of "most notable world music CDs of the last year." Kevin Burke and his highly fluid and ornamented Sligo-style of fiddle is easily one of the most recognizable talents in Irish music today. From his early days with the ground-breaking and now legendary Bothy Band in the mid-70s to his tours with the Irish supergroup Patrick Street and the Celtic Fiddle Festival, Kevin Burke is widely respected as both an ensemble player and a dynamic solo performer. Multi-instrumentalist Cal Scott has been playing a variety of music for years, everything from folk to jazz, on bass, brass and guitar, to name a few. He has honed that musicianship into a career as a composer, arranger and producer. With extensive film and television scores to his credit as well as his own CDs, Cal brings a seasoned and complementary aesthetic to his accompaniment with Burke. He frequently sings his own songs when performing a show with Burke. This is a duo of incredible musical depth. The duo met while Cal was working a score for a documentary on Northern Ireland. Their new CD Across the Black River is a collaboration incorporating their own new compositions, traditional Irish music and even a bluegrass classic. Guest musicians on some of the tracks include Johnny B. Connolly on accordions, Michael McGoldrick on flutes and Phil Baker on double bass. Following the international acclaim in the 1970s with the Bothy Band and his first solo album If the Cap Fits, Kevin Burke moved to the West Coast in 1980. He continued performing with Bothy Band guitarist and singer Michael O Domhnaill and their Promenade and Portland albums became the classic must-haves for Irish music fans. Kevin formed Patrick Street in 1985 and the group continues to tour worldwide and has released an amazing 9 albums. Even Kevin's own solo recordings, especially In Concert, highlight the commanding presence of his solo fiddle. 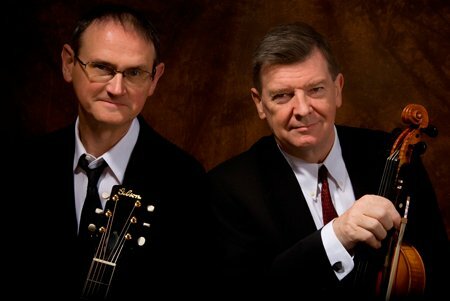 Kevin Burke has never stopped being a tour de force in Irish traditional music. In 2002, he was awarded a National Heritage Fellowship by the National Endowment for the Arts in a ceremony in Washington, DC for his artistic excellence and contributions to the field. It's this country's top honor for a folk artist and previous honorees have included B.B. King and Doc Watson.